Taylor's doctor notices she has swollen lymph nodes and an elevated white blood cell count on her routine annual exam and asks her to return for a follow-up flow cytometry test to rule out chronic lymphocytic leukemia (CLL). Students follow along as Taylor learns more about the test and the disease. The case study outlines the process of flow cytometry, including light scatter, fluorophores, monoclonal antibodies, and fluorescence. Students are introduced to both histograms and dot plot displays and asked to interpret flow cytometry data. 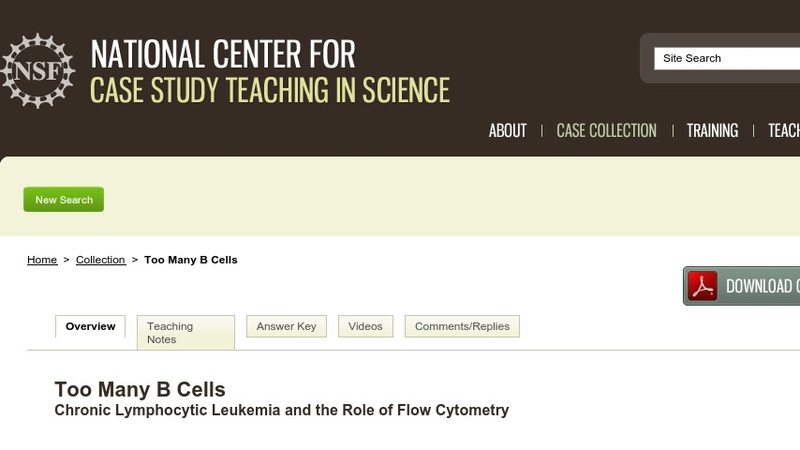 The questions included in the case ask students to apply the principles of flow cytometry. As part of that, students design a test that uses flow cytometry to detect a B cell clone (i.e., the CLL cancer), linking the flow cytometry principles back to Taylor. A histogram of the results of Taylor's blood test assesses student understanding of flow cytometry and leads students to make a diagnosis for Taylor. The case concludes with a discussion of Rituximab, one treatment for CLL. The case would be appropriate for use in immunology, cell biology, developmental biology, and genetics courses.